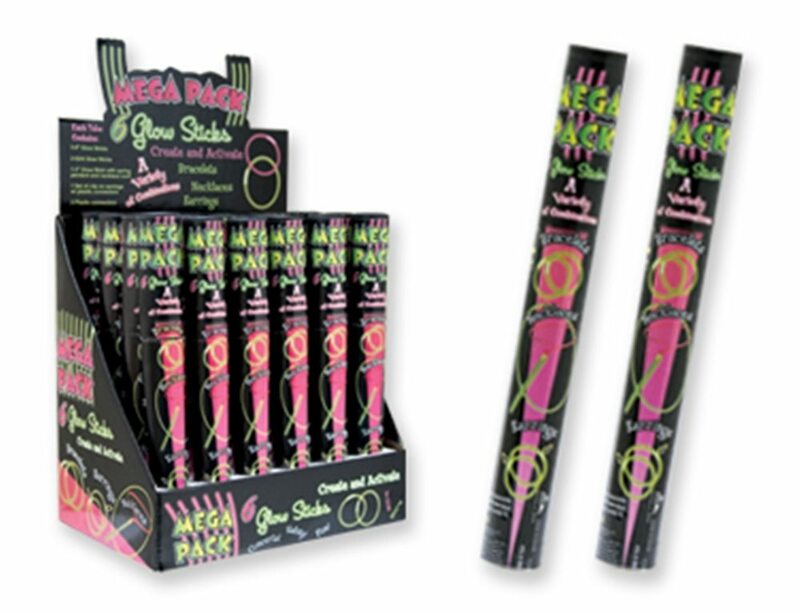 Glow Sticks;Bracelets, Necklaces & Earrings in our 6 piece glow stick Mega Pack! Great for concerts, safety, fireworks and more! Tube includes 3 8" glow sticks, 1 3" glow stick with spring pendant and necklace cord, 1 set of clip on earrings with plastic connector & 3 plastic connectors. Glow will last up to 6 hours. Comes in pink, green, blue & yellow. You will get a MIX of available colors. Only one product included. Includes: 6 Glow Sticks with connectors. Bracelets, Necklaces & Earrings in our 6 piece glow stick Mega Pack! Great for concerts, safety, fireworks and more! Tube includes 3 8" glow sticks, 1 3" glow stick with spring pendant and necklace cord, 1 set of clip on earrings with plastic connector and 3 plastic connectors. Glow will last up to 6 hours. Comes in pink, green, blue & yellow. You will get a MIX of available colors. Only one product included.